The gecko pictured at right is Harry, an incredibly unique and interesting male that I acquired as a young adult back in 2004. This guy is a truly legendary crested gecko, and to this day, I've never seen anything quite like him that wasn't one of his descendants. He and his original breeding group of three females, including the original female Soft Scale, started off as a pet project - something you just have for fun. In fact, the four of them are still together today. I generally don't care if a project like that ever sees the light of day...I just see something that piques my interest, and I want to see what I can do with it. In fact, you didn't see many unique structural traits back then, and you still don't today. A lot of breeders now select for good structure, but no one generally breeds for unique structural traits - probably because you just don't see anything too out of the ordinary very often. Over a decade later, Harry is still breeding, his offspring have been sold to breeders all over the world, and I am breeding his shaggy/spiny structure into a lot of projects. This one gecko has contributed more to the improvement of crest structure than any other gecko in my collection - and probably in the crested gecko hobby in general. What you wouldn't know by looking at Harry, is that some of his descendants eventually developed spiny lateral markings due to Harry's genes being involved - in fact, the spiny lateral markings are now showing up in several separate projects now - will try to post some pictures here soon! So how is Harry's structure inherited? Unlike the Soft Scale structure, which we believe to be a "co-dominant" mutation, this is a selectively bred appearance that comes through in the first generation, but gets better with selective breeding. That's why I've done a ton of outcrossing - so that I could begin breeding Harry line geckos together, without the fear of them being closely related. Even now, they are getting progressively better year after year. The above gecko is a Super Soft Scale from the original Harry x Soft Scale lineage, but was produced many generations into the project, in late 2015. As you can see, there is some pretty serious Tangerine pigment, and Whiteout lateral markings are also present - in fact, Tangerine pigment is making the Whiteout lateral markings pink. For a Super Soft Scale, this is about as shaggy as it gets (thus far). Without having Harry as early as I did, it would take at least another 5-10 years before we'd see this kind of structure in a Super Soft Scale. This guy is great - can't wait to start producing more like him. This is a Super Soft Scale Red Extreme Harlequin with Whiteout lateral markings. She has roots going back to the original Harry x Soft Scale project, amongst several others. She has incredible Harry line structure considering how much outcrossing it took to get this appearance. 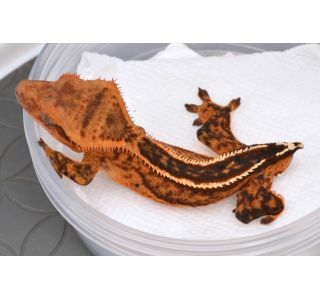 This is one of my favorite geckos of all time - and it'll be a long, long time before we're selling anything like her. This is a great example of what has been done with the Harry lineage.